An estimated 3.3 million used cars sold in the UK during 2015 had a warning against them, a report by mycarcheck.com has warned. Published this week, the 30-page Making Better Used Car Choices drew data from the online search facility’s annual search data and the results of a February 2016 survey of 649 My Car Check customers and found that 46% of vehicles searched in 2015 had at least one warning against them. The most common warnings highlighted by the My Car Check app were associated to plate transfers (48%), write-offs (29%) and finance (13%). Around 48% of My Car Check users preferred to buy from a private source, rather than a dealer, however, with 48% making a car purchase every two to three years. 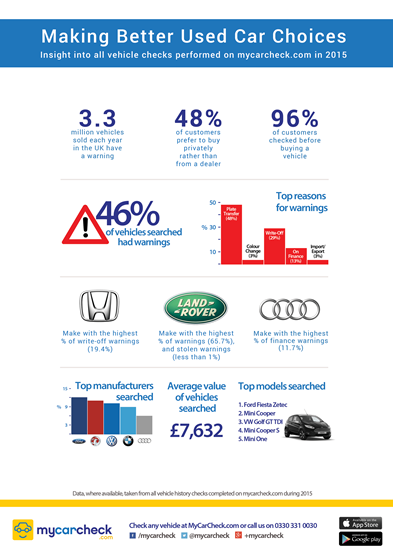 The brand with the highest number of warnings overall was Land Rover (65.75%), with Honda accounting for 19.43% of write-off warnings and Audi 11.78% of finance warnings. Powell said: “Buying a car is a big deal. For the price of a few litres of fuel you can access vital facts and figures the seller might not know, or not want to tell you. “Our checks frequently save people from making costly used car mistakes. However, it is important to note that 54% of our checks come back clear.